It's time that America comes to understand that many of the nation's biggest disparities, from education and life expectancy to poverty, are increasingly due to economic class position," said William Julius Wilson, a Harvard professor who specializes in race and poverty. He noted that despite continuing economic difficulties, minorities have more optimism about the future after Obama's election, while struggling whites do not. Some says that Zionists created and destroyed Soviet Union. Apparently, after that, they have moved to the West. 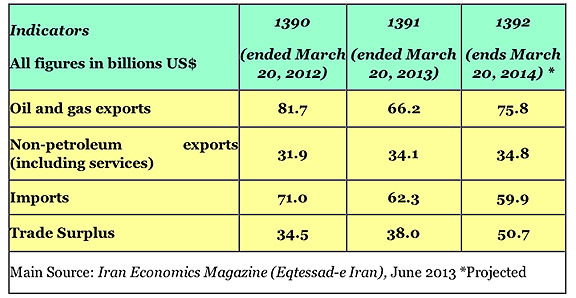 All those numbers in the table deny that Mr. Ahmadinejad's terms have caused "deep" catastrophe in the Iranian economy. Non-petroleum exports and trade surplus show continuing increases and decrease in petroleum revenues was not the previous government fault..
Inflation can be quashed in not too distant period of time, because it was cause by artificial influences and lack of proper cooperation from other branches of the Iranian political system. Correct, all the so-called "leaders" of Bolshevism, Communism and Trotskyites were all Zionist Jews, so are founders of Feminism, Lesbianism and Gayism. The Khazar tribes of roving plundering Jews have been fleecing the Europeans for centuries from even Shakespearean Shylock and Gold merchants. The word "Jew-elry" comes from the Jewish lust for Gold and many of their names are associated with GOLD. Only after Islam's advent the Khazar tribes ran into problems and hence their eternal animosity against Muslims since Islam is diametrically opposed to Jewish practice of usury (interest and money lending)and other bankster frauds. Also these "modern social" movements like Feminism, lesbianism and Gayism are convenient and insidious ways of breaking up the family unit and gender roles and the the sheeple are easy to manipulate via media and Hollywood. Muslim world is more conservative and family centered so the Zionists are having a hard time in Iran and the Middle-East with the color coded "Arab Springs" not working out the way they would like. For example, the sentence above "Taking into account the oil and gas exports, the country [will be] producing a healthy trade surplus" should actually read "Taking into account the oil and gas exports, the country is producing a healthy trade surplus that will help the economy regain a new balance after years of failed economic and trade policies under the Ahmadinejad government." "The fact is that many businesspeople and government officials are not happy about the growing presence of Asian companies and products in the Iranian market. They argue that the lower quality of such products will increase the actual cost to the Iranian economy and believe that Iran should look for ways to reintroduce imports from the more developed economies." Unemployed Mark, if iran is doing well why do you refuse to move there? P.S. your monthly u.s. government assistance check is in the mail. You're welcome. You mean where you choose to live and where millions of iranians dream of living? I am sure some will accuse "Mehr" news agency to be in the pockets of the "Zionists"
Funny how these hypocrites and loony bin Islamists praise the Islamic regime while they are lording it in the West.What I like to know is why are they living in the "dead beat US" and not in Iran or any other god forsaken thired world country like North Korea or Cuba? And by the way I am Iranian and am totaly against the religious and bigoted dictatorship occupying Iranian soil. Thanks for info but lets not forget that it is not Ahmadinejad who is only the messenger boy of Khamenei but the whole edifice of the regime that has destroyed the economy and the country. There are usually less dissidents in societes, and they take less comfortable way of life than majority of their societes. Like history shows those "majorities" are subdued and bribed by totalitarian entities (examples: Hitler's Germany and etc...)to support those regimes. The other difference between Iran and the Imperialistic countries is that they meddle in other countries' matters and use double standards in dealing with other countries. And finally, what do you mean by dictatorship? Is that that when you criticize Zionism and its servants they have the right to retaliate against you? Is that an equality, that Zionists are allowed to ridicule other religions, and whoever makes negative comments about their religion, then he/she has to ..."shut down"?. Thank you for your comment. Agree, Just mentioned his name as it was in the original report by "Mehr" News Agency. I have a suggestion for everyone who do not agree with Mark Pyrouz's rosy picture of the Iranian Economic / Political development in Iran. Please stop ridiculing him or his remarks/ pictures of the constructions and development projects that he posts. Don't attack him personally. It just gives him more credibility and is not a democratic way to debate. He is sitting in the Bay area and is getting his info. using the internet. There is a lot of information (Even withing the heavily censored IRI media) that disprove this rosy picture by Mark Pyrouz, like the one published by "Mehr" news Agency. It is far more effective to use this available info. than personal attack on him or his followers. You are right.There is no need to do personal attacks against Mark because he doesn't know any better and lives in fantasy. The numbers don't add up. Look at the first column. Mark, no offence but where did you get your Ph.D. In mathematics?